This morning, I was reading an article about how telemedicine was improving stroke outcomes in Arkansas. Doctors in remote towns were getting consultation over the phone and Internet. 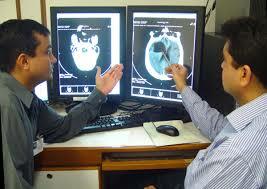 You can send radiology images through e-mail, have a radiologist review it, and then provide advice for the patient. Telemedicine makes it possible for physicians to practice medicine in remote locations. Telemedicine technology was developed primarily to help healthcare providers in remote locations who don't have access to large medical centers. Well, a doctor in Colorado abused this technology and is now paying for it by spending 9 months in jail. His name is Christian Hageseth and he was convicted of practicing medicine in California without a medical license. He did not have an active California medical license and prescribed generic Prozac to a Stanford student John McKay who later committed suicide. So do you need to have an active medical license in every state if you're to practice telemedicine? To be on the safe side, perhaps you should only practice telemedicine within your own state (assuming that you're licensed to practice medicine in your state, of course).